How many containers of cumin do I really need? I have four! With that discovery, it was time to clean out the spice shelf in my kitchen. I brought all of the herbs and spices down from the cupboard. Then, while I finished preparing lunch, Dave started lining everything up in alpha order on the kitchen eating bar. We continued to work as we ate our lunch. After lining up what we had, we started checking the expiration dates. Oh, my, many were so old they didn’t have dates! We placed a wastebasket between our bar stools and began the weeding. After the spices were done and organized back on their shelf, we continued with other items in the cupboard, i.e., the boxes of jello, bottles of food coloring, squares of unsweetened chocolate, hardened bags of marshmallows, and so on. Soon, misson accomplished! We now only have three containers of cumin on the shelf. More importantly, all remaining spices and other dry food products are fresh and arranged so I can find them. I will be less likely to purchase something that I already have in the cupboard. AND, the cupboard is clean! How many new recipes can I find that use cumin? This week I attended eleven educational sessions sponsored by the State Library of Iowa. Barb Corson, Program Director for Information Services, assembled a varied program of classes for the week. The library offers a year-round program for state employees to earn Continuing Education credit. Since the library is tax-supported, the classes are also offered free to Iowa residents. In fact, Iowa residents can attend any classes that the library offers, not just the ones offered during this special week. These classes range from accessing and using current census statistical information, to tips for Google searches and using EBSCO Host for research, from heritage document digital availability to surfing the Iowa Library Services website and the Iowa legislative website, and much more. An aid from the Ombudsman’s office described the Iowa Open Records law and the Iowa Open meetings law. Another presenter demonstrated how to surf the Iowa Legislative website and how to check the status of current legislation. Sad to say, I concluded I need to pay closer attention to Iowa Government. I especially enjoyed the class about all the projects to digitize historical documents by various state agencies and universities and URLs for finding them. I was amazed at all of the information that can be found on or linked to the Iowa Library Services website. This week’s classes were a “golden” (pun intended) opportunity for this newly retired person. All it cost was my time and gas and the effort to fix a brown-bag lunch. And, I even spent a couple hours on Monday at the State Historical Museum, concluding that Dave and I must return soon (usually I only focus on doing research at the historical library and tend to forget about the other part of the building). I enjoyed a walk around the capitol complex on Tuesday, the nicest day of the week. On Wednesday I was thrilled to find and purchase a yogurt maker at Kitchen Collection, an East Village store. (After class on Tuesday I had driven all the way out to Jordan Creek Mall to go to the Williams Sonoma store to find one and the only version they had cost way too much.) I ate some of my delicious homemade yogurt this morning for breakfast. Well, lo and behold, I didn’t realize what Dave was telling me about the quantity of raspberries. Last weekend we took out all of the black raspberries with a date older than 2012, and we took out some red raspberries, also. A total of 61 pints! To fully understand, both black and red raspberries are delicacies in our household. We raise small patches of each in our urban back yard. But we also know where to find some wild black raspberry patches. Some people know where to find morel mushrooms, well, Dave has a sixth sense for finding wild black raspberries (and our sons have inherited this ability). Dave and our now adult sons pick as many as they can find every year. 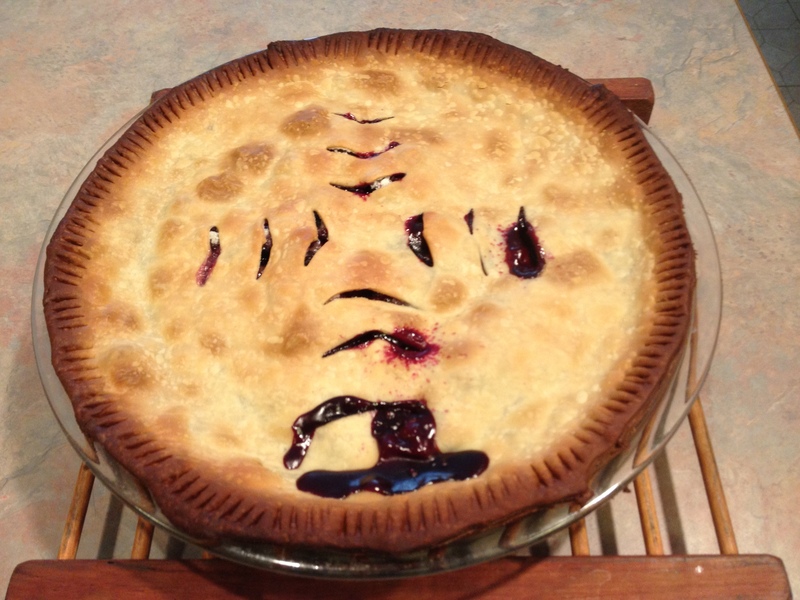 I used to make jam and mass produce black raspberry pies for the freezer, but in recent years I have taken to simply freezing the berries and making pies, as needed. About a month ago we discovered the cupboard was bare… we were completely out of jam. We don’t eat much jam, but it is always nice to have some around. It is unthinkable that I purchase jam at the store… NEVER! Putting together 61 pints of frozen berries and the drought of jam meant last week I spent nearly every day doing some step of making jam. 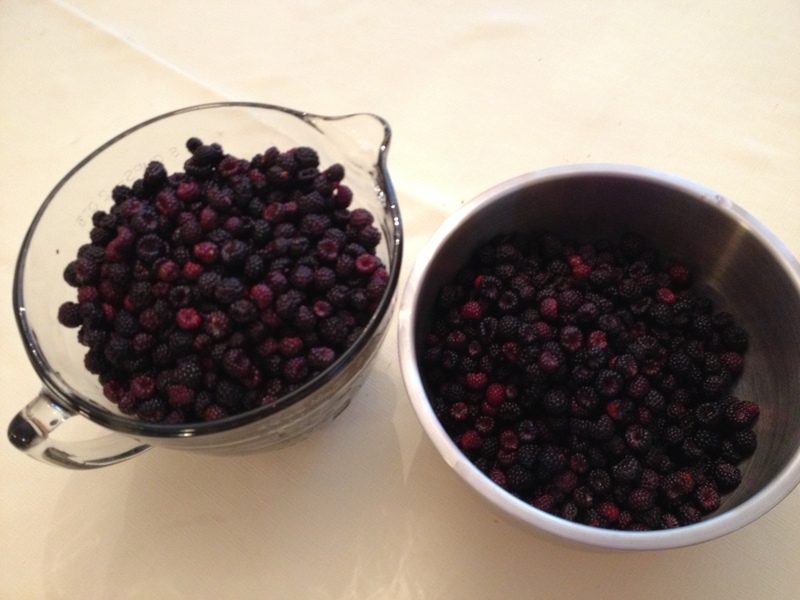 After the berries thawed, I rubbed them through a colander to remove many of the seeds. I washed the jars. Then, calculated how many pounds of sugar, packages of Sure Jell, and boxes of lids to purchase. Finally I was ready to stand over the stove stirring the delicate mixtures, timer primed, and watching the boiling stages to make the perfect jam. Net result: 26 pint jars and 6 half-pint jars of black raspberry, and 3 pint jars and 1 half-pint jar of red raspberry jam. Oh, my, that jam is good on fresh bread and warm baking powder biscuits!